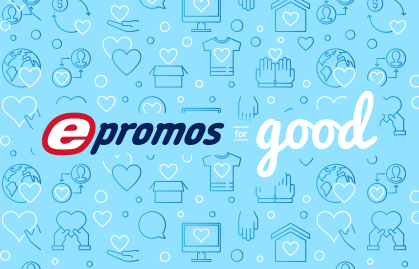 Home / Welcome to ePromos for Good! We’re glad you’re here. Welcome to ePromos for Good! We’re glad you’re here. If you’re employed by or serve on the Board of Directors of a 501(c)(3) organization, accredited school, or religious organization, we want to lend a helping hand for your cause. Bi-monthly in 2019 we’re giving away $500 in free promotional products to an organization in need. For those doing good, we want to do good, too. ePromos believes that promotional products are much more than items imprinted with a logo – they have the power to drive action, inspire change, and make a lasting impact. We want to make a difference by sharing promotional products with organizations that are helping to create a better world. That’s why ePromos for Good was created. Selected organizations may use the promotional items as they see fit – whether it’s thanking volunteers, recruiting donors, or spreading the word about the organization. We’ll work with you to select the best promotional items for your campaign or fundraiser. You can take your pick from any of the 15,000+ promotional products we sell. If selected, you’ll also get free exposure for your organization on ePromos’ social media sites and in our Education Center. Could your organization use $500 in free promotional products? Do you have at least a month before you need the products? Thanks for doing what you do – and good luck! To win $500 in FREE Promotional Products for your Organization! @2015 ePromos Promotional Products, Inc.